Megan Runion // For All Things Lovely: Kelly Green + Libi & Lola Giveaway! Kelly Green + Libi & Lola Giveaway! Top: H&M (current), Pants: Asos (similar), Belt: J. Crew (similar), Earrings: Birthday gift from Leslie, Watch: Michael Kors, Bracelet: Asos Spike, Rings: Kate Spade + c/o GlamRock Designs, Sunnies: Ray Ban, Shoes: Michael Kors, Bag: c/o Libi & Lola, Lips: MAC Plum Liner + Laura Mercier in Violet. Today, Libi and Lola are giving away a $25 giftcard to their online boutique to one lucky For All Things Lovely reader! You can have this bag in your closet, or you can pick anything on the site! The winner will be announced on October 13th. Leave a comment below and let me know you entered! Good Luck! I love the pink clutch and the matte chain necklace! I entered!! I love your green pants! I bought green pants this weekend and thought I might be the only one wearing that colors since Gap had a ton left but I am so happy to see you rocking green also! love the mermaid clutch as well and the poppy blue! Hi Megan, Thanks for a cool giveaway! I entered the contest, and I love the Poppy clutch in Blue! I love the Matte You necklace! Love this look! Those pants are the perfect color! Wow, this sweater is so perfect for fall! Love the cable knit. Love those pants!! I entered!! My favorite piece would be the Tango Clutch! been looking for a belt like this everywhere thanks for the great style stealer! entering into your givewaway! great green pants! Love everything about your style! Thanks for the giveaway, what a great source for more cute fashion! You look stunning, per usual!! I love those pants...heck, I love the whole look...so classic! I entered the giveaway and love the sideways cross necklace!! Hope I win! Thanks for a great giveaway!! You look so classy and gorgeous! I just love that green color. It is amazing! 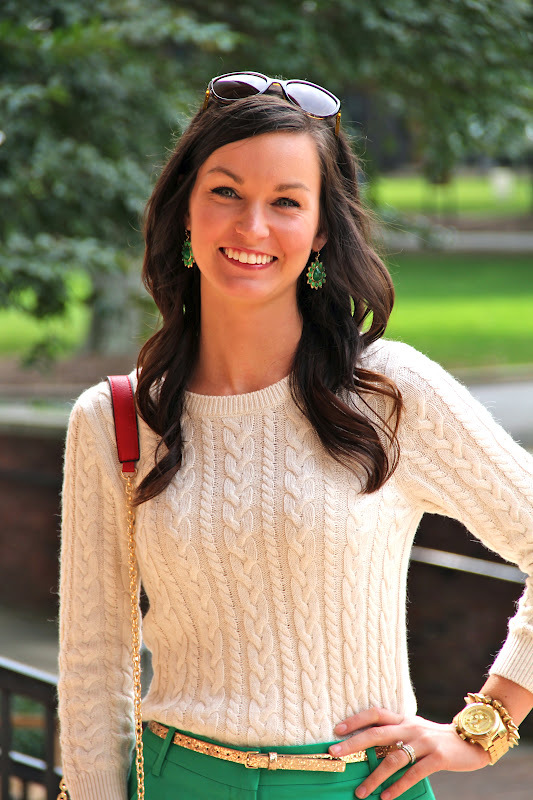 I'm wearing my green pants on my blog today too! Love the way you styled yours! I love these pants!! Great color on you! Kelly green is my favorite :) Love the look! you look super chic and classy. i recently got a spiked gold bracelet like yours and i love to wear it with preppier things (as you did) to give a little edge! I really like the Hynt Bracelet! Lovely outfit btw...love the sparkle belt and the color of the pants! Great color combination! :) Love that your earrings match your pants!! LOVE these pants.. I'm seriously gushing over them! So so so happy I found your blog - giving me so much inspiration! Love the color of your pants! Looking fab! LOVE this look... timeless and classic! Entered your giveaway... and a new follower, love your style! Love these pants, and adore the gold accessories pairing. Fantastic belt! You look beautiful, as usual. Such a beautiful outfit. I entered the giveaway. such a fabulous outfit, especially the pants! Cute outfit! I really love those pants - I have pink ones for similar and love them! Love ur blog! Would u like to follow each other.? You look gorgeous! Your colorful trousers are so chic. I am shopping around for some new business clothes and those green pants are fabulous. I have been seeing that color green lately and it's so bright and beautiful. Even though I spend a lot of time on the phone, I still want to look good! Love everything about this look esp the combo between the chunky knit and the skinny pants. my favorite item is the Positively Around necklace! The No. 5 Earrings!!! gorgeous! and PS. Congrats on your feature in Lucky!! Of course I am following you now, thanks so much for the sweet comment on my blog, I am excited to stay in touch! your blog is really well done, and you have fabulous style! I couldn't decide which I loved more the Lainy bracelet, Paris Band Bracelet, or Coley Braclet. All far too fantastic to choose! Congratulations on your Lucky mag feature and thank you for the opportunity! And I love the Mermaid Clutch. It's so sparke-ly. I like your red clutch. But I prefer the Blue Poppy clutch myself. Thanks for the giveaway. I love your outfit. 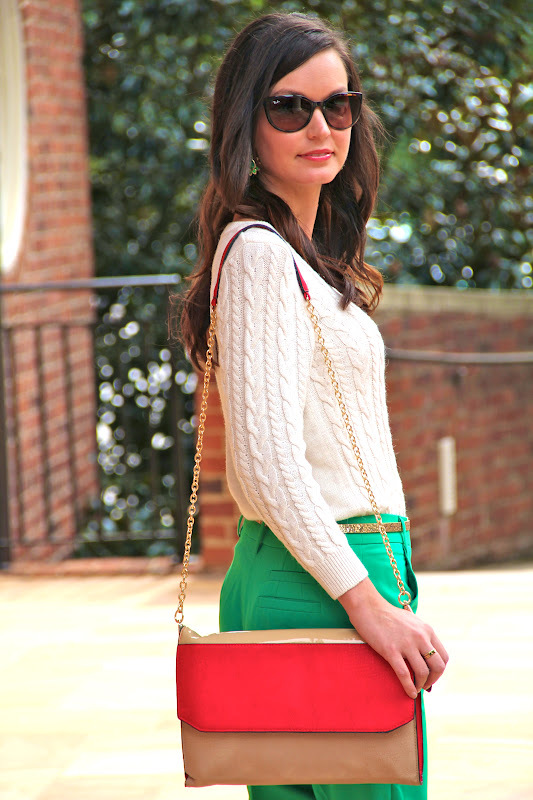 The red and green is great together with a neutral color. Love the Poppy Clutch in blue. So cute. I follow via GFC and I love the pavly turquoise drop earrings!